If you cannot find it, please contact us. 4,100 lb. To 7,200 lb. 7,300 lb. To 27,500 lb. 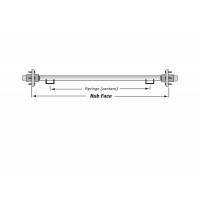 6000# STRAIGHT AXLE BEAM ONLY, HUB FACE 68"
7000# STRAIGHT AXLE BEAM ONLY, HUB FACE 87"
7000# STRAIGHT AXLE BEAM ONLY, HUB FACE 88"
7000# STRAIGHT AXLE BEAM ONLY, HUB FACE 89"
7000# STRAIGHT AXLE BEAM ONLY, HUB FACE 90"
7000# STRAIGHT AXLE BEAM ONLY, HUB FACE 92"
7000# STRAIGHT AXLE BEAM ONLY, HUB FACE 93"
7000# STRAIGHT AXLE BEAM ONLY, HUB FACE 94"
7000# STRAIGHT AXLE BEAM ONLY, HUB FACE 95"
7000# STRAIGHT AXLE COMPLETE, HUB FACE 95"
7000# STRAIGHT AXLE BEAM ONLY, HUB FACE 96"
7000# STRAIGHT AXLE BEAM ONLY, HUB FACE 97"
5200# STRAIGHT AXLE COMPLETE, HUB FACE 75.5"
7000# STRAIGHT AXLE BEAM ONLY, HUB FACE 58-1/2"
7000# STRAIGHT AXLE COMPLETE, HUB FACE 80"
© 2015 Tri County Wheel and Rim All Rights Reserved.